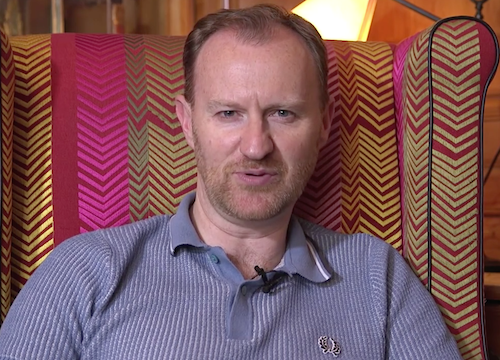 Last week Blogtor sat down with writer and actor Mark Gatiss (The Unquiet Dead, Cold War, et al) to chat about all things Who. With his new episode Sleep No More coming up this weekend, I asked him about the format of the episode, which was initially going to be produced as a two-parter. "That was my plan, I'd always wanted to do a two-parter and I'd plotted the whole thing like that really. But the more I thought about it, with the found footage idea, I thought it's just not going to sustain over two. It's a very particular style and Steve [Moffat, Doctor Who's Executive Producer] agreed. The great thing about a two-parter is you get a cliffhanger and you can spread things in actually quite an old-fashioned way, there's much more dread. I did an early draft where basically just The Doctor and Clara - it was a bit like The Ark in Space - it was just them exploring this empty space station, because you've got time to do it. Whereas, traditionally, you have to ramp everything up now. One of the the things I love about doing Doctor Who, of many things, is the chance to do something unusual and keep pushing the format after fifty-odd years, it's great that it can still do that. It really suits it. There are lovely narrative leaps you can make because it doesn't actually have to be sequential. There's a bit where Reece [Shearsmith who plays Rassmussen] is talking to camera and says, 'We had our own troubles,' and it just goes straight to the spaceship crashing, losing orbit over Neptune. That would normally be a series of scenes but you can just go and cut in - and I found that really exciting." "It was mine! I remember when I saw The Blair Witch Project, which I loved, but I always think that if someone had just given me a black box video tape and said, 'Have you seen this?' Because it comes with attendant publicity and spoilers in that way. I've always had a fondness for anything that differs with the format. Like Jon Pertwee's first season, the titles were never the same one story to another because they were experimenting. But actually it's quite a nice thing to do to change it round like that. I'm very pleased with that. If you look at all the letters that stream across it (within the opening moments of the episode) are the names of the characters and then it just briefly lingers on 'Doctor Who', so you know it's still there! As it fades, have a look!" "I thought to myself, 'I'm going to write this as it it was a horror movie, and then I'll pull back,' but I really didn't. That's the truth of it. It's wonderfully scary, I'm thrilled with how scary it is. I love the monsters, they're very creepy." 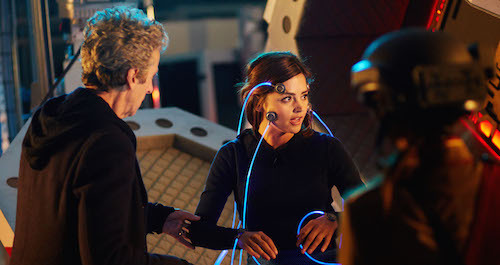 Doctor Who, Sleep No More airs on 8.15pm, Nov 14 on BBC One.